One of the first functions of the phytools library is a function called evol.vcv() (described here) that can be used to test the hypothesis that the instantaneous covariance matrix of multivariate Brownian evolution is different in different parts of a phylogeny with branch lengths. The method implemented in this function is described in an Evolution paper by Dave Collar and myself from 2009. The only problem with the current implementation is that it is limited to revealing only whether or not two matrices (the VCV matrices for different branches in the tree) differ, but not at all how they differ. For a while I have been meaning to implement a version of this method in which various hypotheses about matrix similarity can be tested, but I have not yet had the time to dedicate to this fairly difficult problem. In the interim, and on a user request, I have coded a two-trait version of the function which fits four models: shared correlation and variances (rates); different variances, but shared correlation; different correlation, but shared variances; and, finally, no common structure. 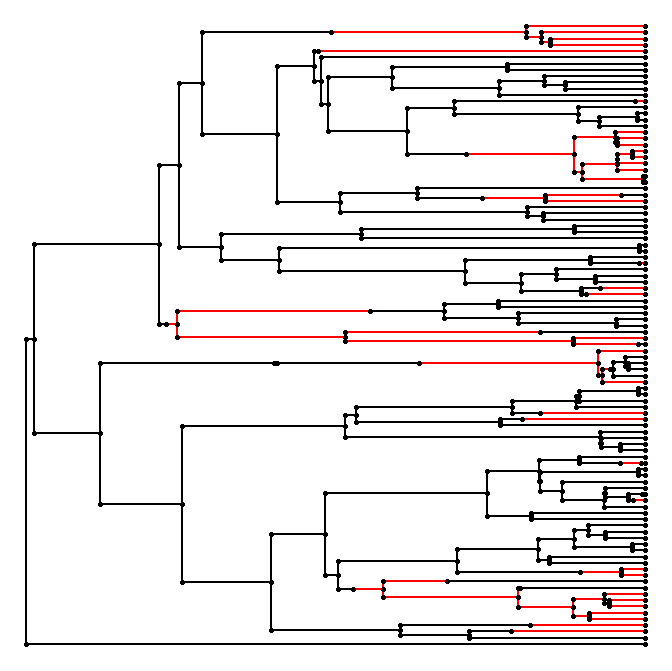 The function is called evolvcv.lite, and I have posted a version to my R phylogenetics page (code here). Now let's simulate two traits evolving on the tree. Trait 1 has a big rate difference between the black branches (slow) and the red branches; whereas the rate difference is much smaller for trait 2. 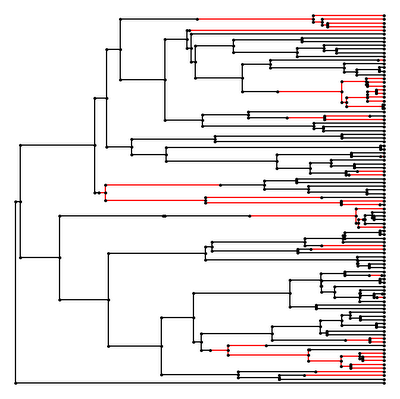 In addition, traits 1 & 2 are uncorrelated on both red and black branches. So here we can see that the best fitting model (based on AIC - we could also use LR tests for nested models) is the model with different evolutionary rates, but a common evolutionary correlation (model 2), not, in fact, the no common structure model (model 4). Neat. Nice job, Liam. The function seems to be working well. I'll keep you posted on my progress with it.